This article is about entering text. For classification of data into types in programming, see Type system. Many touch typists also use keyboard shortcuts when typing on a computer. This allows them to edit their document without having to take their hands off the keyboard to use a mouse. An example of a keyboard shortcut is pressing the Ctrl key plus the S key to save a document as they type, or the Ctrl key plus the Z key to undo a mistake. Many experienced typists can feel or sense when they have made an error and can hit the ← Backspace key and make the correction with no increase in time between keystrokes. Hunt and peck (two-fingered typing "Brady-typing") is a common form of typing in which the typist presses each key individually. Instead of relying on the memorized position of keys, the typist must find each key by sight. Use of this method may also prevent the typist from being able to see what has been typed without glancing away from the keys. Although good accuracy may be achieved, any typing errors that are made may not be noticed immediately due to the user not looking at the screen. There is also the disadvantage that because fewer fingers are used, those that are used are forced to move a much greater distance. There are many idiosyncratic typing styles in between novice-style "hunt and peck" and touch typing. For example, many "hunt and peck" typists have the keyboard layout memorized and are able to type while focusing their gaze on the screen. Some use just two fingers, while others use 3–6 fingers. Some use their fingers very consistently, with the same finger being used to type the same character every time, while others vary the way they use their fingers. One study examining 30 subjects, of varying different styles and expertise, has found minimal difference in typing speed between touch typists and self-taught hybrid typists. According to the study, "The number of fingers does not determine typing speed... People using self-taught typing strategies were found to be as fast as trained typists... instead of the number of fingers, there are other factors that predict typing speed... fast typists... keep their hands fixed on one position, instead of moving them over the keyboard, and more consistently use the same finger to type a certain letter." To quote doctoral candidate Anna Feit: "We were surprised to observe that people who took a typing course, performed at similar average speed and accuracy, as those that taught typing to themselves and only used 6 fingers on average"
Some people combine touch typing and hunt and peck by using a buffering method. In the buffer method, the typist looks at the source copy, mentally stores one or several sentences, then looks at the keyboard and types out the buffer of sentences. This eliminates frequent up and down motions with the head and is used in typing competitions in which the typist is not well versed in touch typing. [clarification needed] Not normally used in day-to-day contact with keyboards, this buffer method is used only when time is of the essence. A late 20th century trend in typing, primarily used with devices with small keyboards (such as PDAs and Smartphones), is thumbing or thumb typing. This can be accomplished using one or both thumbs. Similar to desktop keyboards and input devices, if a user overuses keys which need hard presses and/or have small and unergonomic layouts, it could cause thumb tendonitis or other repetitive strain injury. Words per minute (WPM) is a measure of typing speed, commonly used in recruitment. For the purposes of WPM measurement a word is standardized to five characters or keystrokes. Therefore, "brown" counts as one word, but "mozzarella" counts as two. The benefits of a standardized measurement of input speed are that it enables comparison across language and hardware boundaries. The speed of an Afrikaans-speaking operator in Cape Town can be compared with a French-speaking operator in Paris. In one study of average computer users, the average rate for transcription was 33 words per minute, and 19 words per minute for composition. In the same study, when the group was divided into "fast", "moderate" and "slow" groups, the average speeds were 40 wpm, 35 wpm, and 23 wpm respectively. An average professional typist reaches 50 to 80 wpm, while some positions can require 80 to 95 wpm (usually the minimum required for dispatch positions and other typing jobs), and some advanced typists work at speeds above 120 wpm. Two-finger typists, sometimes also referred to as "hunt and peck" typists, commonly reach sustained speeds of about 37 wpm for memorized text and 27 wpm when copying text, but in bursts may be able to reach speeds of 60 to 70 wpm. 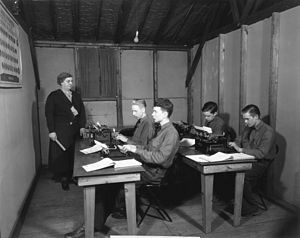 From the 1920s through the 1970s, typing speed (along with shorthand speed) was an important secretarial qualification and typing contests were popular and often publicized by typewriter companies as promotional tools. A less common measure of the speed of a typist, CPM is used to identify the number of characters typed per minute. This is a common measurement for typing programs, or typing tutors, as it can give a more accurate measure of a person's typing speed without having to type for a prolonged period of time. The common conversion factor between WPM and CPM is 5. It is also used occasionally for associating the speed of a reader with the amount they have read. CPM has also been applied to 20th century printers, but modern faster printers more commonly use PPM (pages per minute). The fastest typing speed ever, 216 words per minute, was achieved by Stella Pajunas-Garnand from Chicago in 1946 in one minute on an IBM electric using the QWERTY key layout. As of 2005[update], writer Barbara Blackburn was the fastest English language typist in the world, according to The Guinness Book of World Records. Using the Dvorak Simplified Keyboard, she had maintained 150 wpm for 50 minutes, and 170 wpm for shorter periods, with a peak speed of 212 wpm. Blackburn, who failed her QWERTY typing class in high school, first encountered the Dvorak keyboard in 1938, quickly learned to achieve very high speeds, and occasionally toured giving speed-typing demonstrations during her secretarial career. She appeared on Late Night with David Letterman on January 24, 1985, but felt that Letterman made a spectacle of her. Blackburn died in April 2008. Using a personalized interface, physicist Stephen Hawking, who suffered from amyotrophic lateral sclerosis, managed to type 15 wpm with a switch and adapted software created by Walt Woltosz. Due to a slowdown of his motor skills, his interface was upgraded with an infrared camera that detected "twitches in the cheek muscle under the eye." His typing speed decreased to approximately one word per minute in the later part of his life. The numeric entry, or 10-key, speed is a measure of one's ability to manipulate a numeric keypad. Participants are allowed to enter text naturally, since they may commit errors and correct them. The identification of errors and generation of error rate statistics is easy to automate. The two classes Correct and Incorrect Not Fixed comprise all of the characters in transcribed text. Fixes (F) keystrokes are easy to identify, and include keystrokes such as backspace, delete, cursor movements, and modifier keys. Incorrect Fixed (IF) keystrokes are found in the input stream, but not the transcribed text, and are not editing keys. Using these classes, the Minimum String Distance Error Rate and the Key Strokes per Character statistics can both be calculated. in the above example, the incorrect character ('x') was deleted with a backspace ('<-'). Since these errors do not appear in the transcribed text, the MSD error rate is 0%. This is why there is the key strokes per character (KSPC) statistic. High KSPC values can be related to either many errors which were corrected, or few errors which were not corrected; however, there is no way to distinguish the two. KSPC depend on the text input method, and cannot be used to meaningfully compare two different input methods, such as Qwerty-keyboard and a multi-tap input. There is no obvious way to combine KSPC and MSD into an overall error rate, even though they have an inverse relationship. Error correction efficiency refers to the ease with which the participant performed error correction. Participant conscientiousness is the ratio of corrected errors to the total number of error, which helps distinguish perfectionists from apathetic participants. If C represents the amount of useful information transferred, INF, IF, and F represent the proportion of bandwidth wasted. Since these three error rates are ratios, they are comparable between different devices, something that cannot be done with the KSPC statistic, which is device dependent. Currently, two tools are publicly available for text entry researchers to record text entry performance metrics. The first is TEMA that runs only on the Android (operating system). The second is WebTEM that runs on any device with a modern Web browser, and works with almost all text entry technique. Keystroke dynamics, or typing dynamics, is the obtaining of detailed timing information that describes exactly when each key was pressed and when it was released as a person is typing at a computer keyboard for the identification of humans by their characteristics or traits, similar to speaker recognition. Data needed to analyze keystroke dynamics is obtained by keystroke logging. The behavioral biometric of Keystroke Dynamics uses the manner and rhythm in which an individual types characters on a keyboard or keypad. ^ a b "World's First Typist". Wisconsin Historical Society. Retrieved 2010-09-11. ^ "Wisconsin History Facts". e-ReferenceDesk. Retrieved 2010-09-11. 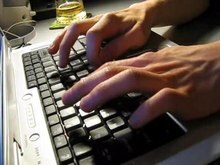 ^ "Ten fingers not needed for fast typing, study shows". phys.org. ^ Karat, C.M., Halverson, C., Horn, D. and Karat, J. (1999), Patterns of entry and correction in large vocabulary continuous speech recognition systems, CHI 99 Conference Proceedings, 568-575. ^ Brown, C. M. (1988). Human-computer interface design guidelines. Norwood, NJ: Ablex Publishing. 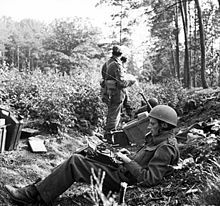 ^ "History of Typewriters | Big Site of Amazing Facts ®". Bigsiteofamazingfacts.com. Retrieved 2012-06-13. ^ "World Records in Typing". Owled.com. 2006-09-02. Retrieved 2012-06-13. ^ "IBM Archives: Typing posture". 03.ibm.com. Retrieved 2012-06-13. ^ "Believe it or not ..." Deskstore.com. Retrieved 2012-06-13. ^ a b "Barbara Blackburn, the World's Fastest Typist". Retrieved 2008-05-08. ^ Jean-Didier Febvay & Jonathan Gutierrez. "international typing speed contest". Typing Zone. Retrieved 2019-01-17. ^ "256 wpm race - former all-time TypeRacer record". YouTube. Retrieved December 3, 2016. ^ "Typing - Replay of Sean Wrona's highscore of 174 wpm". hi-games.net. Retrieved 2012-06-13. ^ "Sean Wrona, official site". ^ "How Does Stephen Hawking Talk? (video)". Singularity Hub. 2010-05-03. Retrieved 2012-06-13. ^ "The man who saves Stephen Hawking's voice". newscientist.com. ^ "Soukoreff, R. W., & MacKenzie, I. S. (2003). Metrics for text entry research: An evaluation of MSD and KSPC, and a new unified error metric. Proceedings of the ACM Conference on Human Factors in Computing Systems - CHI 2003, pp. 113-120. New York: ACM". ^ Castellucci, Steven J.; MacKenzie, I. Scott (2011-01-01). "Gathering Text Entry Metrics on Android Devices". CHI '11 Extended Abstracts on Human Factors in Computing Systems. CHI EA '11. New York, NY, USA: ACM: 1507–1512. doi:10.1145/1979742.1979799. ISBN 9781450302685. ^ Arif, Ahmed Sabbir; Mazalek, Ali (2016-01-01). "WebTEM: A Web Application to Record Text Entry Metrics". Proceedings of the 2016 ACM on Interactive Surfaces and Spaces. ISS '16. New York, NY, USA: ACM: 415–420. doi:10.1145/2992154.2996791. ISBN 9781450342483. ^ "User authentication through typing biometrics features" (PDF). pku.edu.cn. ^ "Continuous authentication by analysis of keyboard typing characteristics - IET Conference Publication". ieeexplore.ieee.org.